(CPJ) – Authorities in the Comoros should immediately release journalists Abdallah Abdou Hassane and Oubeidillah Mchangama, who have been held in pretrial detention on an array of charges for over a month, the Committee to Protect Journalists said today. 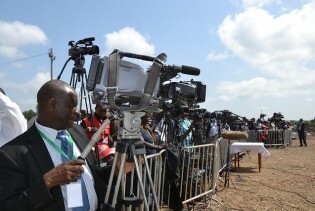 (CPJ) – Zambia's minister of information and broadcasting should grant an appeal requested by the privately owned Prime TV broadcaster and allow the station back on air after the country's media regulator suspended its license for 30 days for alleged unprofessionalism, the Committee to Protect Journalists said today. On Saturday 9th March, a small group of activists from Ghana, concerned by the continued incarceration of Ugandan feminist activist Dr Stella Nyanzi, rallied by the symbolic national independence Square to raise awareness on the dangers of remaining quiet to injustice. On International Women's Day, CPJ has highlighted the cases of female journalists jailed around the world in retaliation for their work. At least 33 of the 251 journalists in jail at the time of CPJ's prison census are women. At least one of those--Turkish reporter and artist Zehra Dogan--was released in February after serving a sentence on anti-state charges. The four female journalists jailed in Saudi Arabia were detained over their criticism of the kingdom's ban on women driving. South Africa, one of the media freedom beacons in sub-Saharan Africa, will hold national and provincial elections on May 8. As the country celebrates 25 years of democracy, the press in South Africa faces old and new challenges, including physical harassment and cyber bullying. The press freedom environment, including the safety of journalists, will be one of the key indicators for the health of the country's democracy and the freeness and fairness of its polls. (CPJ) – The Committee to Protect Journalists joined more than 15 rights organizations and the #KeepItOn Coalition to call for Nigerian authorities to ensure that internet and social media services remain connected during upcoming elections, and safeguard internet speeds of websites and messaging applications. In early February, Nigeria's federal government denied rumors of plans to shut down the internet during upcoming elections, according to the privately owned Guardian Nigeria and Quartz news outlets. Nigeria has two sets of elections scheduled in the coming weeks: federal elections on February 16 and state elections on March 2. (CPJ) – The Philippine government's legal harassment of the news website Rappler and Maria Ressa, its founder and executive editor, took an alarming turn Wednesday when officers from the National Bureau of Investigation arrested Ressa at Rappler's bureau in Manila and held her overnight over a cyber libel case filed against her by the Justice Department. Ressa's arrest was in connection to a story published by Rappler in 2012, before the law was enacted. Ressa told CPJ before her arrest that the charge was "political" and that the Philippines has "weaponized" its cybercrime law. Ressa was released on bail on Thursday morning. CPJ's Asia Program Coordinator Steven Butler explored the implications of Ressa's arrest for press freedom in an op-ed for CNN. Since announcing his candidacy in the 2016 presidential elections to the end of his second year in office, U.S. President Donald Trump has sent 1,339 tweets about the media that were critical, insinuating, condemning, or threatening. (CPJ) - Rodney Sieh, editor-in-chief and publisher of Liberian investigative outlet FrontPageAfrica, knows first-hand the harassment and risks critical journalists in his country face. In 2013, CPJ documented how he was sentenced to prison over unpaid fines in a criminal defamation case. Journalism is dangerous work. Dozens of reporters and other media workers are killed in the line of duty each year. Hundreds more face threats, intimidation, and harassment as they risk their lives to let us know what is going on in war zones and as they root out corruption. In the Information Age, the Internet provides us with new ways to disseminate the news even as it poses new threats to press freedoms. IPS Director General Farhana Haque Rahman was invited by UNESCO as a panelist at the World Press Freedom Day 2017 gathering in Jakarta, in the Plenary Session: Quality journalism: a public good for just, peaceful and inclusive societies.